Hellenic College Holy Cross has cross-registration agreements with Boston College, all fellow member institutions of the Boston Theological Institute, College Year in Athens, Newbury College, and Regis College. Similar partnerships with other schools are currently under discussion. To learn more about these partnerships and the benefits offered to HCHC students, please contact the Office of the Registrar. Hellenic College has formed an exciting new partnership with Regis College, a leading Roman Catholic university just outside Boston. 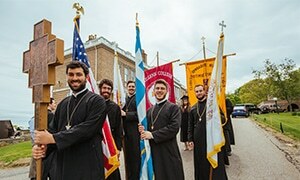 Beginning in Spring 2018, Hellenic College students who are accepted into Regis master’s degree programs in the following disciplines through HCHC’s preferred admissions agreement with Regis will obtain a two-year master’s degree in one year, thus completing a BA and MA in approximately five years. Hellenic College undergraduates in the Elementary Education program will have preferred admission into the Regis master’s program in Special Education and begin taking classes toward the master’s degree during their final year at Hellenic, with only one year at Regis needed thereafter to complete the MA. Hellenic College students majoring in Human Development will have preferred admission to the Regis Master of Arts in Counseling Psychology program, beginning classes toward the MA at Regis during their final undergraduate year at Hellenic, allowing them to earn the graduate degree with only one additional year of study. Hellenic College students in the four other undergraduate programs currently offered—Classics and Greek Studies, Literature and History, Management and Leadership, and Religious Studies—are eligible for preferred admission to the Regis Master of Arts in Heritage Studies program. They too will be able to take advantage of a combined, accelerated five-year BA/MA option. As part of this program, Hellenic College students will have their Regis application fees and GRE requirements waived. Students may register for a graduate course in their junior or senior year at no charge, and will receive preferred admission without the competition of the rest of the applicant pool.